Are you ready to throw out your hex-wrenches and go tool free? 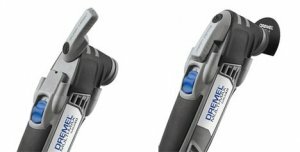 After I just finished my review of both Bosch multi-tools, Dremel comes out with news of their new tool-less MM40. This lack of a tool-less feature is one of complaints with the current Bosch offerings, but not because they require tools, only because they require tools that can easily be lost. The new MM40 from Dremel also gets a power boost up to 2.5 amps from 1.5amps. This puts the power rating up with the big boys, and offers a variable speed range of 10,000 to 21,000. The MM40 also feature a new fan cooling system that is designed to overcome some of the heats issues of the past model. I still don't understand why Bosch allows Dremel to compete with them, especially since they are in the same price range, but the new Dremel offering is indeed impressive and only leads me to believe that the next Bosch offering will be even better. Dremel also announced a second new Multi-Max called MM20, but it doesn't have the tool-less blade change feature and it has less power at 2.3 amps, so it lost our interest. With these announcements also comes news that Dremel is expanding their accessory line, offering blades in more sizes that work with the new Quick Fit tool-less system and still work with the existing Multi-Max. The MM20 is suggested to retail for $99.99, and the MM40 for $139.99. The should hot store shelves in September and November, respectively.